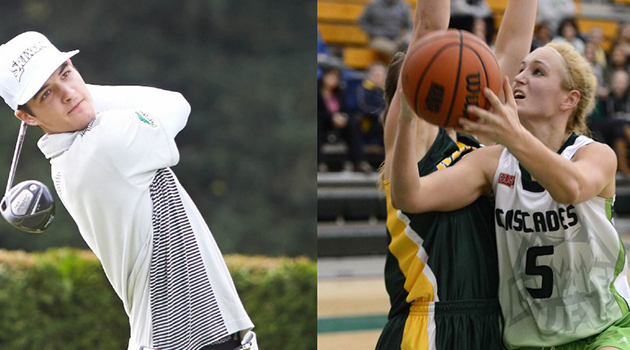 Aaron Pauls and Sarah Wierks are the University of the Fraser Valley’s latest athletes of the year. Sarah Wierks and Aaron Pauls were named the University of the Fraser Valley’s athletes of the year on Tuesday evening, as the Cascades athletic department held its annual awards banquet at the Ramada Plaza and Conference Centre. Wierks, a 6’2” fifth-year centre with the women’s basketball team, was honoured for a historic season. The Chilliwack native was the first player in team history to earn Canada West first team all-star honours, and became just the second Cascades athlete across all sports to earn a CIS All-Canadian nod. Wierks not only led Canada West in scoring at 19.2 points per game (good for fourth in the nation), she also put together the greatest rebounding season in conference history. The Chilliwack product set single-season Canada West records for total rebounds (307) and rebounding average (15.4), and tied the record for double-doubles (18). She also established single-game marks for offensive rebounds (12), defensive rebounds (20) and total rebounds (31). She led the nation in rebounding by a huge margin, finishing 4.1 boards per game ahead of her nearest competitor. The male athlete of the year was golfer Pauls, a fellow Chilliwack product who made history of his own in 2014-15. He became the first UFV athlete in any sport to be selected to participate in the World University Games, finishing 17th in the men’s golf event in Crans-Montana, Switzerland last June. Thanks in part to his efforts, Team Canada finished fifth, its best-ever result. Pauls also captained the Cascades men’s golf team to its third straight PacWest title and a bronze medal at CCAA nationals, while picking up a PacWest all-star nod and a CCAA Academic All-Canadian award along the way. Other major award recipients included rookies of the year Monika Levarsky and Tammer Byrne, outstanding community award winner Jasper Moedt, and Jen Simpson Memorial Leadership Award winner Stephen Wall. Levarsky made an instant impact with the women’s soccer team, scoring six goals to tie Shelby Beck for team-high honours during the regular season. The striker from Surrey also earned a Canada West second team all-star award. Byrne, an Abbotsford product, stepped right into the lineup for the Cascades men’s soccer team as a rookie. He started all 12 Canada West league games, and was outstanding on the backline. Moedt distinguished himself on the court with the men’s basketball team, leading Canada West in rebounding and earning conference second team all-star honours, but he truly set himself apart with his off-court impact. He worked with Speak Up, a community group committed to changing the perception of mental health in society, and helped lead seminars in more than 45 high schools and post-secondary institutions in the Fraser Valley. He was also on the planning committee for the 2015 Balancing Our Minds event at Rogers Arena, and was an ambassador for UFV’s new peer support centre. Rower Stephen Wall was the recipient of the Jen Simpson Memorial Leadership Award, which honours leadership in three areas: on an athletic team, in academics and involvement at UFV, and in the community. Wall helped to build a strong bond within the rowing program, organizing work groups and social functions. The Coquitlam native was also the chief organizer for the Row for the Cure ergathon which raised funds for cancer research, and he helped organize and coach the campus learn-to-row program. On the water, Wall excelled with pairs partner Kyle Krahn, making the A final at the Western Canadian University Championships and earning selection to the national championships. The awards banquet was also highlighted by coaches’ presentations to the graduating fifth-year seniors; inspirational speeches from UFV president Dr. Mark Evered and alumni representative Nicole Wierks; and a tribute to UFV men’s soccer coach Alan Errington, who is set to retire at the end of the month. Bob Lenarduzzi, president of Vancouver Whitecaps FC, was in attendance to speak about his longtime friend and colleague Errington, who fashioned a legendary career with the Canadian national men’s program and with the Vancouver 86ers and Whitecaps prior to taking the helm of the Cascades and helping them grow into a Canada West contender.